Two rare, iconic, fully endorsed EMT reverbs — bundled to save. By bundling two of the most legendary reverbs ever made, the EMT® Classic Reverb Plug-In Bundle for UAD-2 and Apollo interfaces saves you 20% compared with buying the plug-ins solo. 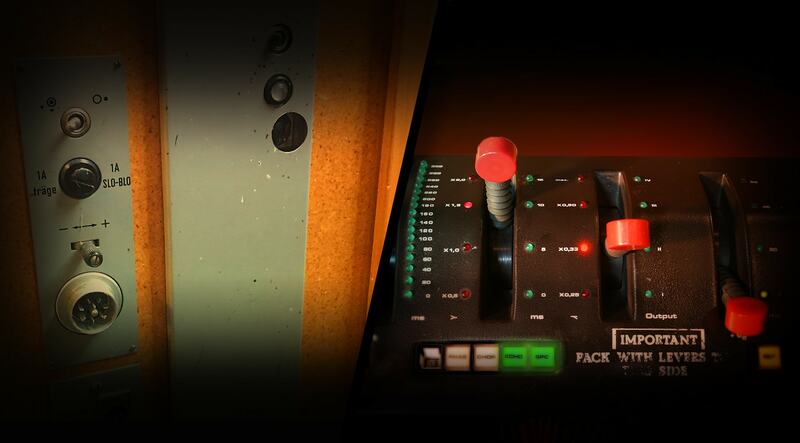 From the lush plate textures of the EMT 140 plug-in, to the expansive, reverb, phasing, chorus, and echo effects of the EMT 250 plug-in, the EMT Classic Reverb Plug-In Bundle features the only emulations of these revered reverbs fully endorsed by EMT International GmbH. The EMT 140 Classic Plate Reverberator plug-in for UAD-2 hardware and Apollo interfaces gives you the organic lushness that only plate reverb can provide. By expertly modeling three uniquely different EMT 140s installed at The Plant Studios in Sausalito, California, the EMT 140 plug-in will infuse your sources with the unmistakable warmth and beauty of this iconic plate reverb. Still regarded as one of the best-sounding reverb units ever made, the EMT® 250 Classic Electronic Reverb plug-in for UAD-2 and Apollo interfaces is a faithful emulation of the first digital reverb/modulation effects unit introduced in 1976. Designed in conjunction with EMT 250 designer Dr. Barry Blesser, the UAD plug-in version uses the same algorithms found in the original, extremely rare hardware. The EMT 250 plug-in was modeled from Allen Sides’ “golden unit” EMT 250 that resides at the legendary United/Ocean Way Recording. It's great. Buy it. I am forced to write more, as the text length I wrote was too short. I repeat: it's great. Buy it. Sheer beauty, like a girlfriend you cannot live without! I've searched everywhere for a good sounding all around universal plugin and I must say this plugin is now in my heavy rotation of go to plugins. ...nicht übel...hat was ... was nostalgisches. Könnte mehr Presets vertragen !!! This is my go-to reverb, ppl demo this asap it will transform your mixes!!! This along with the EMT 140 is out of this world! Enjoy them both for different reasons, but the 250 has the character I like most and also a touch brighter and cuts through the mix the way I like it to! ...nicht übel...hat was ... was nostalgisches. Könnte mehr Presets vertragen !!! I'm a very great fan of reverbs and have some ones I like to use. I was watching EMT for a while and, after test it few hours with some of my real mixes, I noticed the it sounds much better than my favorite Plate. I mean it is dense, warm, with nice resolution. It sounds like a non digital. It sounds real. Good for a lot of things. It's graphical interface is pretty, simple, fast and easy to use. EMT now figures my session's Plate's Bus. My favorite reverb now. Classy, smooth, versatile, elegant and truly professional sounding. So easy to be used in a tasteful way. Brings things to life without the fuss. A terrific and affordable weapon and tribute to the past. 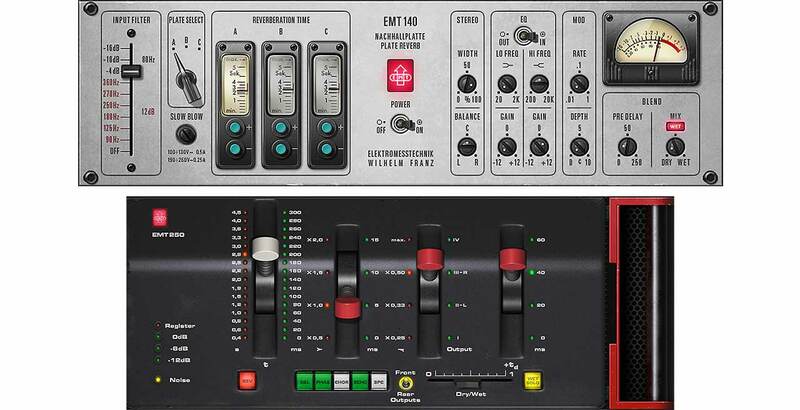 EMT 140 Plug-In always "at hand"
One of the best sounding plug-ins I have heard let alone used. Excellent on most all Vocals and Acoustic Instruments, flawless! The reverb part of the plug is really special. A very "light" kind of sound that have the ability to become almost unoticeable in the mix. So if you want to apply a lot of reverb on a source without muddying your mix this unit really is a must. As the EMT 140 this unit is very easy to use. 4 parameters only but a lot of different results. The chorus part is really nice too. It can be very large and rich while supporting a mono reduction without sounding weak and phasy. The echo/delay part is nothing special. The space part doesn't compete against the Eventide Black Hole... but this is not an everyday FX. The reverb only would get 5 stars from me ! This ended up being my go to UAD reverb. It is not so much a dreamy reverb as it is a clean reverb that helps ground the source to the mix. The other FX are also wonderful. Wow ,,,,What a slick verb. I have the 224 which is way the deal! But!!!! when I add this puppy with it I get some very nice lush verb's. It's little bit of a tric to get it figured out as far as using it, so use the presets to get started and tweek it from there. By starting with the presets you also learn how it's being set up for the different verb and chorus settings stored. I really am hung up on it, I spent the better part of all nite last week playin with it. I got into it way deep on my BV trac's using the chorus side and it blew my mind right outta my head. Just a touch of it here and there made the tracs sit right down in the mix. Reminded me of the concrete delay room at Studio In The Country a studio Katrina killed. Git it. On 80's I mixed a lot of classic albums here in Brasil at Transamérica Studios in São Paulo using the original EMT 240 and EMT 251 reberbs and when i tried the 140 UA Plug ins i came back 25 years and the new experience was amazing! Thanks for 12 years of fabulous plugs UA!! The EMT 250 is worth every penny. Not only does it sound beautiful as a Reverb unit, but it also comes packed with 4 extra FX (and they are all great!). The Chorus is so amazing and works wonderfully on background vocals and electric guitars. But the Reverb is definitely my favorite. It's so lush, yet it doesn't muddy up your tracks. So good! I personally liked it better than all the other UAD offerings, YMMV. WARNING: Be careful when you demo this thing, you may end up wanting it :P.
Great emulation once again from Universal Audio ! Im using a quad apollo at the minute which is complimented by the 4-710D. Jaw dropping. This is the kind of plugin that makes mixing more fun. It adds depth, width, and ambiance. It sounds great on all source material. Reverb plugins usually have really brittle, tinny, a/o false decay tails. I have tried a bunch of other plugins from IK Multimedia, Waves, and a few others. This thing buries them all in terms of sound and usability. I have been really impressed with most of the UA plugins but this thing is off the scale. I use it on every session now and get amazing results quickly and without fail. Sounds just like the original, lush, clear, and great tweaking capabilities. It's my go to plate reverb. The DAWs I use have their own built in reverbs, so to buy another reverb for a back bedroom studio seemed overkill to me. Then I tried the EMT140 Demo...... I expected it to sound great (and it does!) but the surprise was how EASY it was to get a great sound. In very little time, and with only a few tweaks, you're there, you have a reverb that sounds great in your mix. I`ve been working with the real EMT 250 in the early 80`s. The PlugIn sounds and behaves just like the real thing. Thanks for the brilliant work you do at UA. it makes my work so much easier!